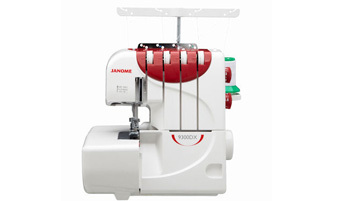 The Janome 9300DX gives you a wide range of overlockingfeatures in a compact machine. It’s sturdy design and precise Janome stitch performance ensures a professional finish every time. It comes pre-threaded and has a built-in rolled hem feature (no plate change) for easy changeover. The differential feed prevents puckering and stretching, and can be used for fun special effects and the upper knife can be deactivated for decorative sewing. Colour coded paths make threading so easy. Other features include whisper-quiet operation and an electronic foot control.